Most of your data entry will be done on the 'Follow-Up I' tab of the data entry form. For most Graphs pre and postOP subjective refraction (sph, cyl and axis), UDVA and CDVA, 'Target Refraction' (which will be used to calculate the 'Attempted Correction') is needed. For that reason at least these values must be entered. Entering date and type of surgery is mandatory for a correct filing. The date of follow up exams ('FU_Date') will be used to calculate the follow up visit label ('month'), expressing the time difference between treatment date and follow up exam date. The follow up date is optional and you may directly select the follow up label in the month column. Try to enter follow up data in a 1-3-6-12 month grid whenever possible, as most graphs will take these time intervals by default. If needed, you can change the follow up visit label manually. For example you may want to use a 4 month follow up data as '3 m', in case the patient missed his 3 month visit. If you have two or more exams in the same month you may use the 'extra visit' labels further down on the drop down list. Please enter a '0' in the SPH and CYL column if the patient is spherical or plano, as otherwise the spherical equivalents will not be calculated and this treatment will not be included in your graphs. Using the 'Tab' key when going from field to field will fill out the CYL and AXIS field automatically. It is important to keep in mind that 'empty' is not the same as 'zero'. A plano case is to be entered as 0, 0, 180 (type '0 tab tab') for SPH, CYL and AXIS for example. 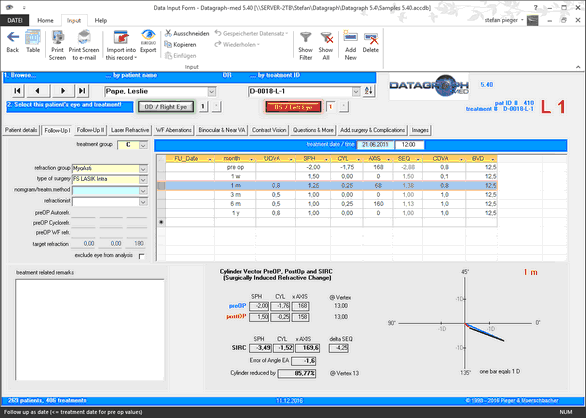 Datagraph-med accepts both, plus and minus cylinder notation and converts it internally to minus cylinder.